BENTONVILLE, Ark., Sept. 5, 2018 – As Walmart expands its Grocery Delivery service, giving its customers the option to shop when and how they want, the company today announced a new last-mile delivery pilot – Spark Delivery – exploring an additional way to get groceries from their stores to customers’ front doors. Spark Delivery is a crowd-sourced delivery platform that allows Walmart to learn even more about the full last-mile delivery process. The pilot uses an in-house platform that provides drivers with the ability to sign up for windows of time that work best for their schedule as well as Grocery Delivery order details, navigation assistance and more. Components of Spark are powered by Bringg, a leading delivery logistics technology platform. Walmart’s team of personal shoppers are an important component of the overall process as they meticulously shop for customers’ orders. Spark Delivery engages the services of independent drivers who partner with Delivery Drivers, Inc, a nationwide firm who specializes in last-mile contractor management, to complete deliveries. We’re saving customers time by leveraging new technology, and connecting all the parts of our business into a single seamless shopping experience: great stores, easy pickup, fast delivery, and apps and websites that are simple to use. We’re serving our customers in ways that no one else can. Using our size and scale, we’re bringing the best of Walmart to customers across the country. Spark Delivery is one way we’re exploring how to get quality groceries from our door to our customers’ doors. - Greg Foran, president and CEO, Walmart U.S. Delivery Drivers, Inc., DDI, the administrator of driver management for Spark, manages recruiting, screening and background checks, payment, and accounting, among other services for drivers. Drivers are paid by the delivery. They also have access to helpful services and information through DDI, including assistance in understanding order flow, group discounts and a Contractor Entrepreneurial Program that helps drivers establish their own small businesses. Combined with third-party crowd-sourced delivery providers, Walmart is well on its way to bringing Delivery to 100 metro areas covering 40 percent of U.S. households. Today, the retailer’s Grocery Delivery service is available in nearly 50 markets including Atlanta, Chicago, Denver, Miami and Seattle. Walmart’s work with third-party delivery providers continues to be a leading part of delivery strategy and important to the future, even as this pilot begins. Spark Delivery is currently being piloted in Nashville and New Orleans with plans to roll out to a few more metro areas this year. Nothing changes for delivery customers in these markets. Customers still follow the same easy process to get quality, affordable groceries delivered to their doors. Walmart Grocery Delivery brings customers the option of shopping when and where they want for quality, fresh produce, meat, seafood and bakery items, along with pantry staples, consumables and seasonal general merchandise. Customers place their orders online at Walmart.com/grocery or on the existing Walmart Grocery App, and unlike other services, they find the same everyday low prices on items that they do in stores. The retailer also offers an Online Grocery Pickup service that allows customers to order their groceries online and pick them up in stores without ever getting out of their cars. The service, which has become a customer favorite and touted as a “Grocery Hero” for moms on the go and time-strapped families, is now available in 1,800 stores, with a total of 2,100 to be open by the end of the year. 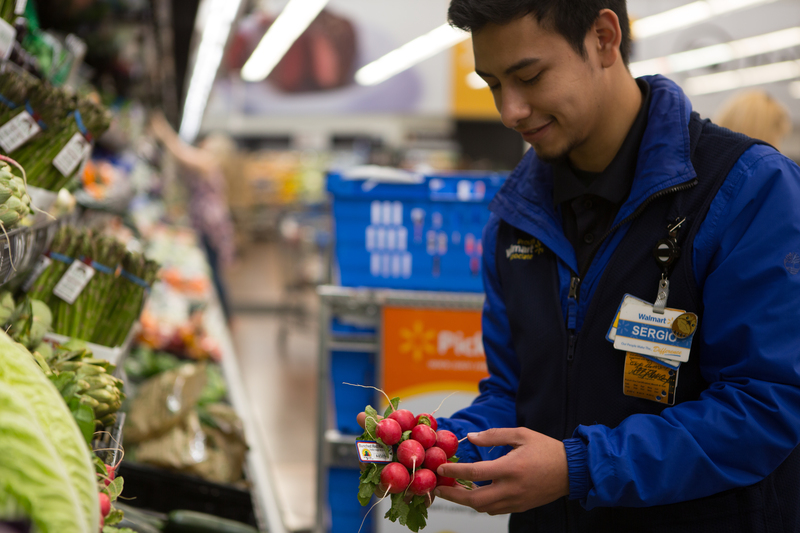 Walmart employs more than 25,000 personal shoppers, up from 18,000 earlier this year, who power this program – with thousands more being added. These associates must complete a three-week training program to learn how to select the freshest produce and the best cuts of meat for Online Grocery customers. Groceries can be delivered to customers as soon as the same day. Walmart’s Grocery Delivery carries a $9.95 fee and a $30 minimum order – no subscription, no price markups. Customers can get their first order over $50 delivered for free with promo code FRESHCAR.